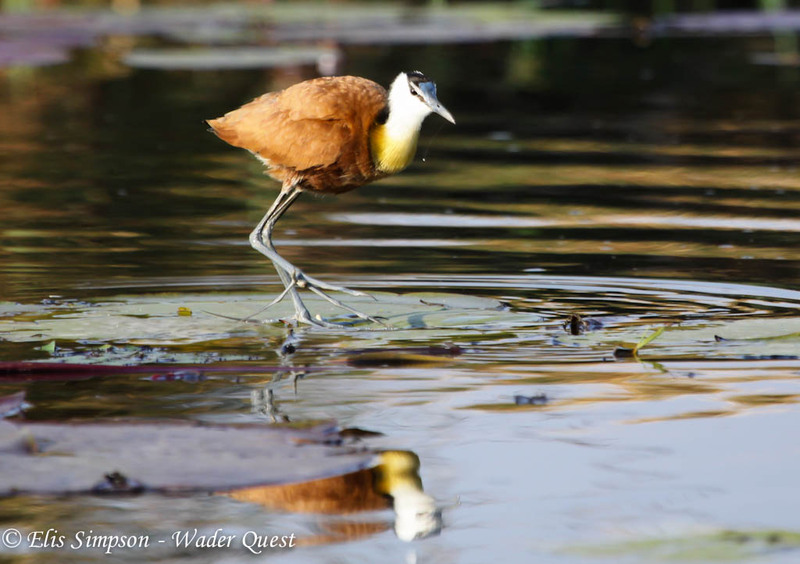 Wader Quest: One morning, one boat ride and six new species! One morning, one boat ride and six new species! 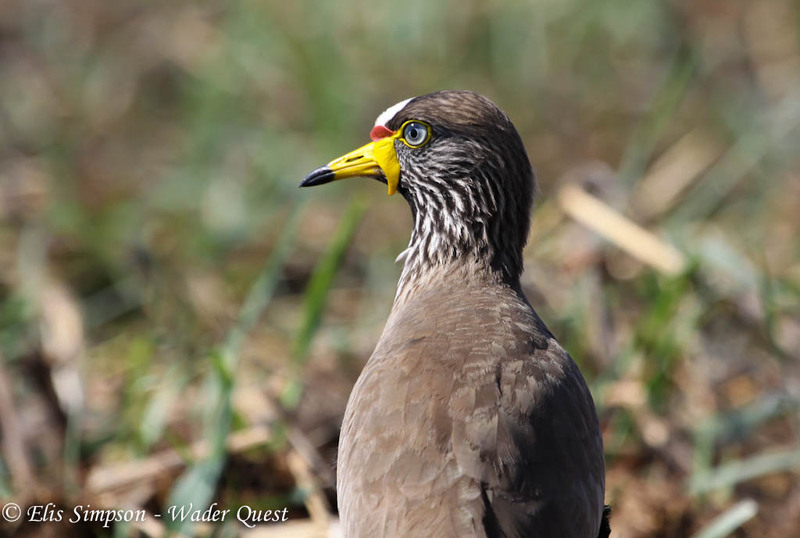 There are mornings in birding that you would sooner forget and then there are others that you will never forget, the morning when we took a boat ride on the Chobi river is one such morning. The same crew as before set forth to discover the delights to be found in the region. 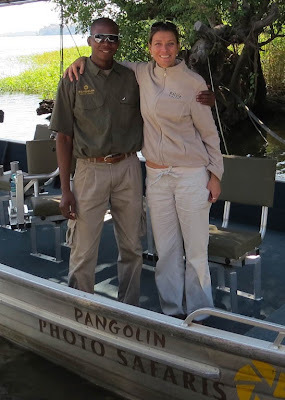 The boat run by Pangolin Photo Safaris is especially adapted for photographers with swivel chairs and camera mounts. They even lend you a camera if you desire. L to R; Rick, Jenny, Kim, Sue, Megan, Peter and Kirsten of Pangolin. Elis took the picture. 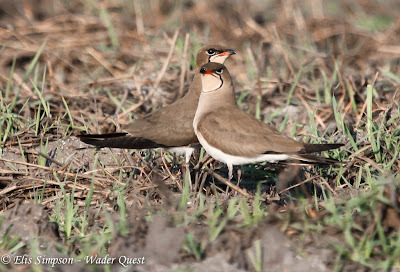 We started off by returning to the rapids area where we had seen the Rock Pratincoles from the bank the day before and enjoyed some stunning views of them a lot closer this time. 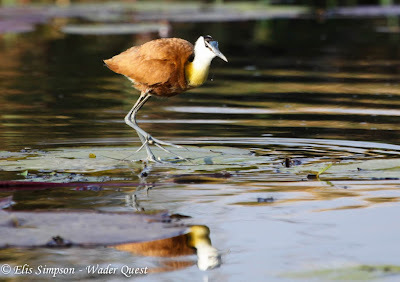 On the way down river to the rapids Elis spotted an African Jacana this was our first Wader Quest tick for the morning. 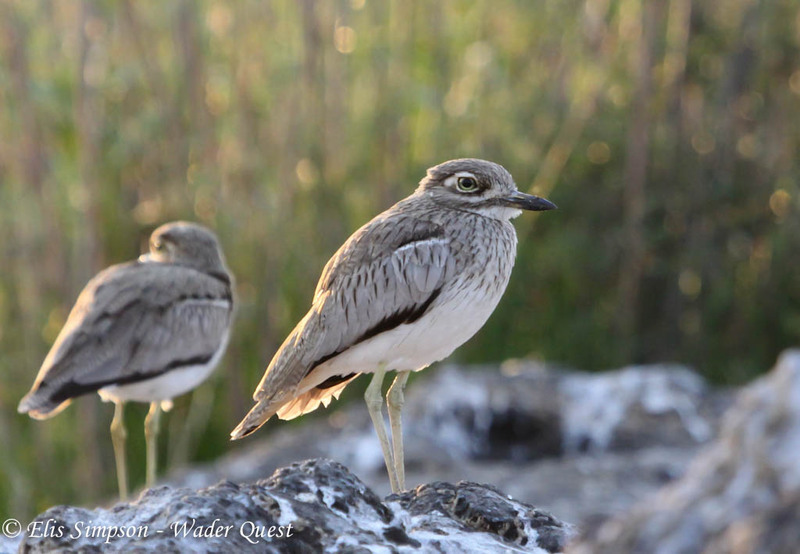 As we watched the pratincoles we came across some Water Thick-knees alongside them on the same rocks, species number two under the belt. From this point we headed upstream and found a large area of grassland on an island, midstream. As we approached we noticed an unfamiliar lapwing showing much white in the wing in flight, drawing closer we saw that it was Long-toed Lapwing, number three. We managed to approach fairly close to these birds but our concentration on enjoying them was thwarted by the sight of several Collared Pratincoles flying around and some soon landed within reach of Elis' lens, the count reaches four. Then came a marathon belt upstream for species number five, stopping on the way to check for yet another possibility without any luck. Without doubt, lapwings are among the most attractive of waders and our species number five was surely one of, if not the, most attractive; White-crowned Lapwing. 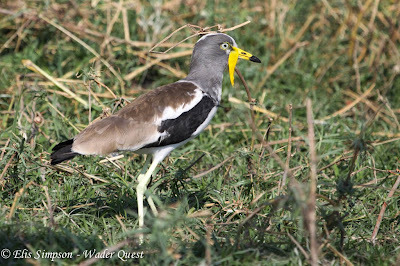 We were now running out of time so we had to head back to base, as we did so we took a different route taking in the other side of some of the river islands, suddenly a shout from the crew brought the boat to a stop, and there was the species we didn't see earlier, another lapwing and another beauty, African Wattled Lapwing. 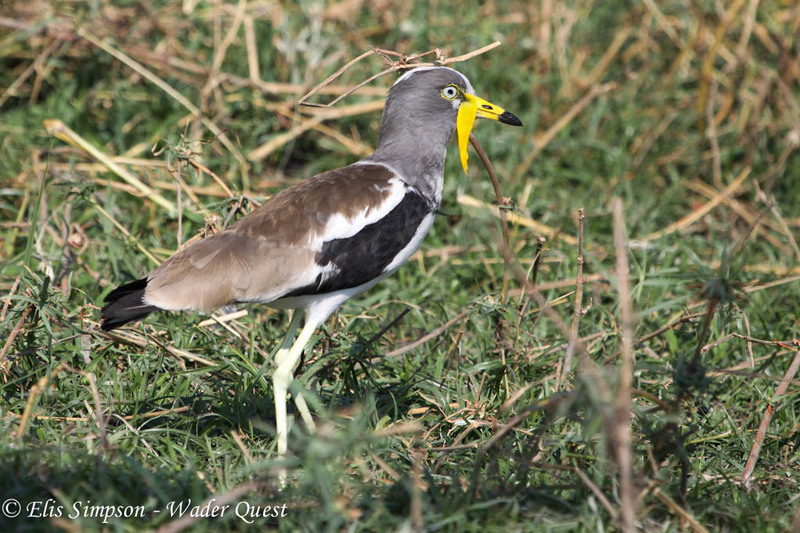 African Wattled Lapwing Vanellus senegallus. 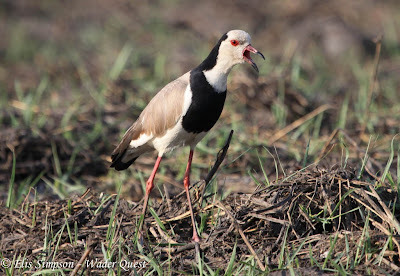 That was quite some morning and as we saw three of our target lapwings in one go, adding to the three we had already seen, we completed our list of lapwing species for the trip, very satisfying. The Pangolin crew were very helpful and pulled out all the stops to help us find the species, we highly recommend them. Pangolin Photo Safaris can be contacted on http://www.pangolinphoto.com/. The Pangolin Photo Safaris crew; Shah the driver and Kirstin. We then moved on into Namibia and although we searched every nook and cranny for waders we failed to come up with any new species for the list. You are leading a charmed life! I have to say that at times it does feel like that but you have to put up with a lot of rough with every bit of smooth when you are travelling. Not that I'm complaining you understand!